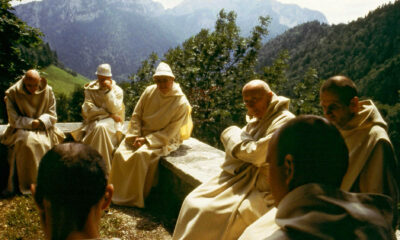 Nearly 20 years after his initial request, filmmaker Philip Gröning was granted permission by the General Prior of the Grande Chartreuse monastery, located high in the French Alps, to document the day-to-day routines of the reclusive Carthusian Order of Monks, a centuries-old Roman Catholic brotherhood of whom next to no aural or visual documentation exists. Gröning was required to live and work among the monks, filming by himself on hi-definition video and Super 8 for only a few hours a day, using only available light and sound. The resulting work, Into Great Silence, is a masterful object of contemplation, a 162-minute journey into a cloistered world of ritualistic repetition, always with the promise of revelation and transcendence. Gröning structures the film primarily with an eye toward outsiders: the three subjects he returns to time and again are a black novice-in-training, an elderly jack-of-all-trades who tends to the monastery’s general upkeep, and a blind monk who patiently sits and prays before offering, in the film’s subtly ironic climactic scene, a verbose thematic summation. In structuring Into Great Silence around this particular trio—indeed, they’re something of the film’s holy trinity—it is Gröning’s intent, I think, to strip away his audience’s prejudices. Human beings are practically conditioned to notice such things as skin color or infirmity first and foremost—out of these superficial indicators we make snap composite judgments about everything from economic background to educational degree, from sexual preference to religious denomination. Yet as Gröning’s camera acclimates to the Grande Chartreuse’s sequestered rhythms there comes with it an increasing sense of liberation. Faces and actions repeat and recur, the seasons segue quietly, one into the other, and the tendencies and/or flaws of the human body cease to rule the day. The monks still maintain their unique distinctions of self, but are now united (as are we) in common purpose and singular pursuit. Pursuit of what exactly? Call it God. Call it Cinema. Every person has their sublime object of worship and Gröning’s film offers up some striking and unforgettable parallels between religious and artistic struggle.